MANILA, Philippines - Young artists of Team Bamboo got standing ovation from "The Voice Kids" coaches as they performed Alamid's hit "Your Love" in the Sunday's episode of top-rating vocal competition. Elha Mae Nympha, a banana cue vendor, impressed coach Bamboo over 'Loving Daughter from Rizal' Kate Campo and 'Small but Incredible Boy' from Cebu' Paul Abellana in the battle round of 'The Voice Kids'. "Napakasarap lang pakinggan yung version na ginawa 'nyo from the perspective ng bata," Coach Sarah said as she then picked Kate. "I don't think, I've ever heard that song more beautiful than right there. But, I guessed the one who stood out for me dahil umpisa palang ng kanta nandun na siya kaya ang pipiliin ko ay si Paul," Coach Lea said. "Kate, I can't believe what comes of you, yung emotion. Elha, you sing beyond your age. And Paul, ikaw ang nagdadala ng kanta eh," Coach Bamboo said. Coach Bamboo chose Elha to be one of his team's representative on the next round, Sing-offs. 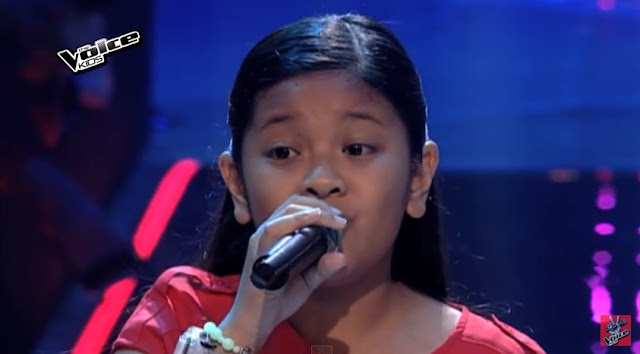 WATCH: The Voice Kids Philippines Battle Round: Elha vs Paul vs Kate (video courtesy of ABS-CBN). The episode of The Battles on Sunday dominates online conversations with '#TVK2Battles' among the trending topics.